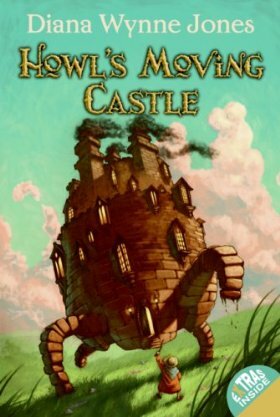 Howl’s Moving Castle is a young adult fantasy novel by Diana Wynne Jones, perhaps one of the best known authors writing fantasy and science fiction with over 30 books published. This particular work of hers is a Boston Globe-Horn Book Honor Book, an ALA Notable Book, and an ALA Best of the Best in YA. 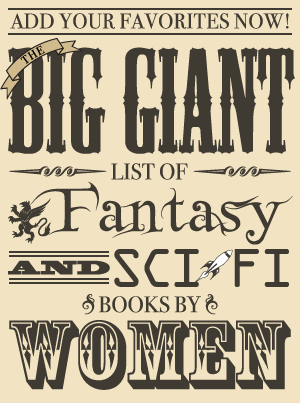 It has two loosely connected sequels, Castle in the Air and House of Many Ways. These two books both have different main characters than the first novel, but the main characters from Howl’s Moving Castle do make appearances. As the eldest of three girls, Sophie Hatter has resigned herself to being the least successful daughter in the family. So it is hardly surprising to her when her two sisters get to move away to become apprentices (with the youngest in the position to have the greatest adventures, of course! ), leaving her behind to make hats day after day. In spite of her talent for making lovely hats, Sophie’s life remains rather dull until the Witch of the Waste comes to her family’s shop. The Witch of the Waste has heard of Sophie and views her as competition – and for this crime she turns Sophie into an old lady and renders her incapable of telling anyone she is under a spell. Sophie accepts her new fate just as easily as she accepted her old one, but she decides she’d better leave before her stepmother finds her in this state. Eventually she finds herself near the noisy moving castle belonging to the infamous wizard Howl, reputed to steal the souls of girls. As an old woman, Sophie figures she’s safe and the idea of sitting by a nice warm fire is too alluring to turn down. So she commands the castle to stop and climbs aboard to the dismay of the wizard’s apprentice Michael, claiming she wishes to wait for the Wizard Howl as the only one who can help her. Once she is settled in, she discovers the fire in the hearth can talk. It is actually Calcifer, a fire demon who made a contract with Howl and now must remain in the wizard’s fireplace. Calcifer can see that Sophie has been enchanted and makes a deal with her: if she can figure out how to break his contract with the wizard Howl and free him from his agreement, he’ll make her young again. Ever since I saw the Hayao Miyazaki’s movie based on Howl’s Moving Castle, I’ve wanted to read the book. I purchased it one day when I saw it in the bookstore, but I was recently reminded I should read it when Ana raved about it. With some further encouragement from Chachic and Twitter nagging urging from Janicu, I decided to take a break from the long book I was reading and finally read this book. Thank you to all of them for the incentive to finally read Howl’s Moving Castle – it was a charming original story that still had a classic fairy tale feel. Because of this, Sophie always expected her youngest sister to be given the best opportunity for success while the other is put in a position to find a good husband (as she’ll not amount to much as the middle child, either). In spite of Sophie’s resignation to her own fate, her sisters are not as ready to be dictated by their positions and actually quietly trade places. Nor does Sophie end up as the least successful sister – she may have it rough for a while but she still finds adventure and romance. At the same time, that doesn’t mean her sisters don’t have a role to play or end up miserable failures in the end, either. Once Sophie is transformed into an elderly lady by the Witch of the Waste, the rest of her character changes, too. Before this, she just accepted her circumstances and was rather timid. When she first meets Howl (without even realizing he’s the man accused of eating girl’s hearts), she appears terrified and he calls her “a little gray mouse” because of it. After she’s an old woman, she’s still rather accepting of her lot, but she soon notes that her point of view has altered. Elderly Sophie is much more bold – she doesn’t fear Howl at all, as evidenced by how she bursts into his castle and takes charge. She bullies Calcifer into getting what she wants. When she needs an excuse to stay in hopes that her hex can be broken, she tells Howl she’s his new cleaning lady. This prompts Howl to ask her who said she was, to which Sophie responds, “I do.” In some ways, the Witch of the Waste did Sophie a favor as she takes control of her life instead of spending her days talking to hats until she naturally becomes an old woman. Sophie is not the only charming character; of course, there is also Howl himself who works wonderfully as a likable yet extremely flawed character. He’s a charismatic, talented wizard who is also compassionate with a tendency to undercharge the poor who come to him. At the same time, he’s also prone to fits of temper, a womanizer, and a very vain man who spends a couple hours in the bathroom getting ready to go out every morning. (There’s a brief interview with Jones in the back, and I rather liked her comment about finding it surprising that girls wrote to her saying they wanted to marry Howl: “My opinion of Howl is that, much as I love him, he’s the last man I would want to marry. Apart from anything else, I would want to get into the bathroom sometimes.”) The fact that he has so many bad and good qualities makes him such a fleshed out, believable character and that’s part of what makes him so endearing and memorable. The conclusion and how everything tied together was also well done. It would be fun to look for all the hints about breaking the contract and more about what caused the Witch of the Waste’s ire at Sophie on a reread. Howl’s Moving Castle is a delightful story. It’s not a familiar fairy tale, but it seems like one with witches, demons, curses, magic, and wizards all accepted very matter-of-factly as part of the world. The main characters are flawed enough to be realistic but not so flawed that they’re not likable. To top it all off, there’s an undertone of humor and a nicely wrapped up ending. This is a definite keeper. Where I got my reading copy: I bought it. « Release Date for A Dance With Dragons!